← “Electronic Flirtation” Music Video! After a year overseas with performances in Beirut, Prague, and throughout the post-Soviet Republic of Armenia, Raffi Joe Wartanian returns to Baltimore’s Minás Gallery & Boutique with renowned guitarist Brian Kooken to celebrate the release of PUSHKIN STREET, his debut album of eleven original “gypsy zest” songs.The Happy Hours‘ own Rebecca Messner will kick off the evening with original folk songs inspired by Pennsylvania farm country, rye whiskey, old friends, and hurricanes. 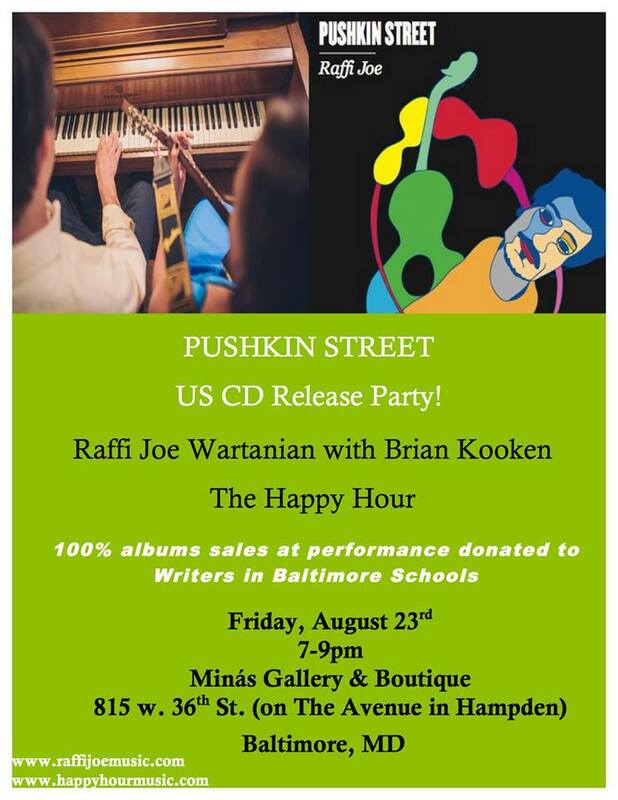 Concert entry will be free with a suggested donation of $5, and 100% of CD sales at the performance will be donated to Writers in Baltimore Schools, a program that provides low-income middle school students with a vibrant environment for literary development through in-school, after school, and summer creative writing workshops taught by Baltimore college students. PUSHKIN STREET will be on sale for $10.